Theatre Is Easy | Reviews | Cry, Trojans! To purchase tickets visit stannswarehouse.org or call 718-254-8770. Cry, Trojans! Photo by Paula Court. BOTTOM LINE: A breakneck mash-up of the Bard and Native American cinema both confounds and exhilarates. Troilus and Cressida is among Shakespeare’s more impenetrable works. Produced rarely, and dismissed often, the play is his take on the epic collision of the Greeks and the Trojans over the abduction of Helen, wife of Greek King Menelaus, at the hands of Paris, Prince of Troy. This particular mythology is most often attributed to Homer’s Iliad, however Shakespeare’s text draws on, among others, Chaucer’s account, expanding the secondary plot line of Troilus, a Trojan prince, and his love Cressida, another Trojan who is offered to the Greeks in exchange for a prisoner of war. The Wooster Group’s adaptation, Cry, Trojans!, arrives at St. Ann’s Warehouse following a previous incarnation in London, as a collaborative production with the Royal Shakespeare Company. The British company played the Greeks, while their American counterparts played the Trojans (directed then as they are now by Artistic Director Elizabeth LeCompte). Each group rehearsed in isolation from the other, and the production was only fully realized when the two met in London for performances as part of the 2012 Summer Olympics. The current version is a reworking of this collaboration, with The Wooster Group all but eliminating the presence of the Greeks, and focusing acutely upon their Native American conception of the Trojans. Though the production does not overcome the opacity for which Shakespeare’s play is criticized, it does very fully embrace the problems of the script -- the radical shifts of mood, the confounding behavior of many key characters, the distancing nature of the text -- achieving an emotional through-line where plot falls short. Wooster mainstay Scott Shepherd (Gatz) introduces the evening in the affected vanilla tone that comes to define his Troilus, outlining the RSC collaboration and the cowboy-mask conceit they will use when mimicking the Brit’s performances of Greek characters. 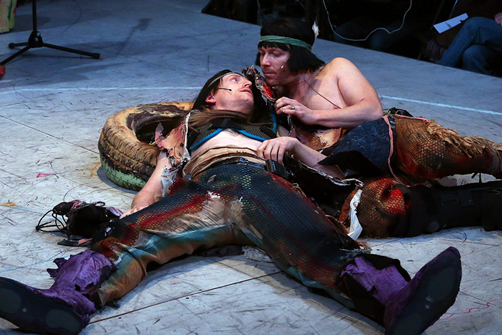 It is a boyish, folksy opening, with other Trojans making their way onstage with a variety of colorful musical instruments, and ending with Shepherd’s send off: “I hope you like this song.” From here, the play rapidly thrusts itself into an existential abyss, with the heavy weight of Bruce Odland’s chaotic soundscape dropping firmly into place, grinding ferociously with Shepherd’s quaint politesse. Such is the effect of LeCompte's vision of Troy. A kind of tonal cacophony sustains the entire evening, with stability being cyclically established and undermined, and the natural flow of events and relationships kept just out of reach by the physical and emotional world they inhabit (a charming post-coital scene between Troilus and Cressida is punctuated by alternating haymakers, each connecting with an explosive release of nightmarish bass drones). It is not always an experience that feels coherent, or accessible, but as is true of the Group’s canon of work, it is deeply stimulating and engages a performative experience outside of narrative clarity. Much as the operation of the theatrical machine is laid bare by the two operators sitting at the front of the audience manipulating the technical elements of the production in real time, so too the gears of Shakespeare’s imperfect machine are on display, with LeCompte’s distinct physical language revealing an emotional structure that might be muddied by an otherwise problematic script.